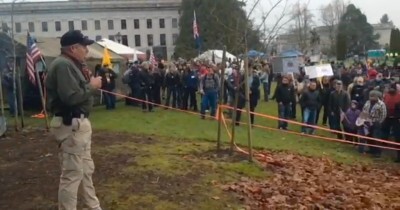 2000+ Armed Patriots Defy Gun Laws in America's Largest Felony Civil Disobedience. 2000+ Armed Patriots Defy Felony Gun Restriction. 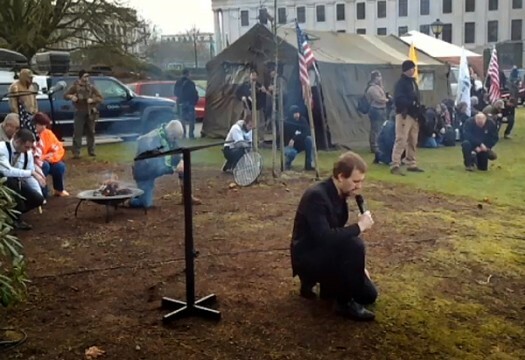 Update 1 Year Later: Today marks the anniversary of the day more than 2000 patriots came ARMED to the State Capital and defied felony gun restrictions in front of the world. We disobeyed that lawless law and than 700 signed the Declaration of Affirmation. More events followed; not protests, but principled defiance into to Oregon and beyond. A year later, despite naysayers and failed lawsuits from weak kneed gun groups, i594 has not been enforced and there have been no arrests as it is openly ignored by those with the principle to stand for liberty. We showed the world that our rights do not come from legislators, but from God. Gav stopped for a prayer for America and courage to take her back. 12/13/14 a shot heard round the world. Without a shot fired! by Gav Seim: For years people have been talking about nullification. Today the world is talking, the tyrants are reeling and most politicians don’t even know what to say as they sit in slack jawed silence. It’s day for the history books. Because despite the millions spent by tyrants, one of the most lawless anti-gun bills in American history, i594, is DEAD! Defeated with a few thousand dollars and the principled rag tag, gun toting patriots who stood up and said NO MORE! Here’s what you need to know: i594 is NOT law. It is legally void and has been legally nullified! You don’t need to obey it. The action that has been talked about by liberty groups for years, was taken on by brave patriots from all over America on Saturday. By God’s grace and bold liberty, we had victory here! We got on our knees and we stood bold on our feet. Not a single shot fired, nor a piece of litter left on the ground. The day i594 passed the vote, I announced the I Will Not Comply Rally, to complete what I had I talked about in this video a month before. Thanks to a great team of people like the Bosworth’s, Kit Lange, and many others, patriots united. We did it without permits, judges, negotiations or political favors. The key was liberty, principle and resolve. We would not even waver to comply with the normally required permit to hold this rally at the capital. Most gun groups refused to stand with us because we would not play political games, some openly opposed us, but to their shame the people stood anyways. They came from all over America because we were finally making a real stand, instead of playing politics. We showed the world that the collective has no authority to vote away the rights of the individual. We are done negotiating for our nights. Nullification of bad law means to render impotent, void or powerless. You know those laws about chewing gum on Sunday or holding hands in public? They are null and void, even if still on the books. That’s what we did here. We still look to our legislators to remove it. In fact we have empowered them to do so and some of them even stood with us. I can’t say how proud I am of my team who helped make this rally happen and the people who stood with us in person, with donations and with prayers. When 594 passed, we did not wait. Using momentum instead of playing politics, we won a victory for liberty that can be duplicated all over and used to end lawless law. Act swiftly — Let me stand with ten principled for liberty, than a thousand who bow to tyranny and lick the boots of tyrants. The Lewis County prosecutor and Sheriff just said they would NOT ARREST OR CHARGE people for what we did here. This has huge implications, because for any prosecutor to charge an individual after this point, would raise the issue of selective enforcement. Sure they could try and prosecute folks. But now that 594 has been nullified by the people, enforcement is unlikely to work. We the people must disobey lawless law. This was the largest felony disobedience rally in American history. We traded guns, we bought them, we sold them. We defied tyranny and the officers stood by and upheld their oath. — America just did what has never been done. The media will downplay numbers, they will pretend that the WSP did not act because we were not in violation. We controlled the conversation, not the media. Cope Reynolds speaking to the patriots joined Sheriff Mack, Mike Vanderboegh, Rep Elizabeth Scott and many others. Throughout the day, 2000-3000 came with hundreds more watching live online. We did exactly what we came for and this is just the beginning. 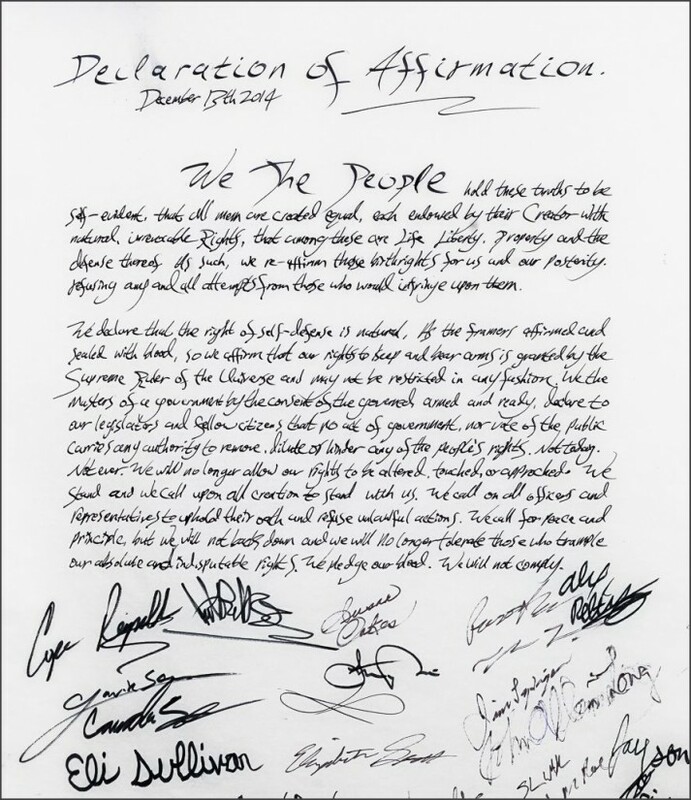 We signed the declaration that day and what a beautiful thing all those signatures are. Where were our National and State gun rights and liberty groups? I’m sad to report they were nowhere to be seen, even though they were openly invited. We did not protest, we violated. We did not ask, we demanded. We the people affirmed liberty and law, right up to the end where lawless concealed carry permits were thrown into open flames. Permits, infringements and gun restrictions of all kinds must go. These are not law, they are lawless. It’s not about guns, it’s about liberty and we are taking back our liberty. Do NOT comply, nullify! Stand bold. Stand proud, stand principled. You can also read my personal reflections on the rally. The Declaration over 700 signed that. day. See the entire thing and sign online here.